Top-notch Gatineau Service At Your Senses Beauty! You are here:Home » Product Reviews » Top-notch Gatineau Service At Your Senses Beauty! Be enchanted by Your Senses Beauty, a petite beauty salon nestled right in the heart of Square 2 at the Novena MRT station. Owner Grace, an ex-beauty trainer, impressed me with her skills & expertise, & delivered a splendid Gatineau facial treatment according to my skin type. Never have I been attended by a beautician who carries such grace with an impressive profile. 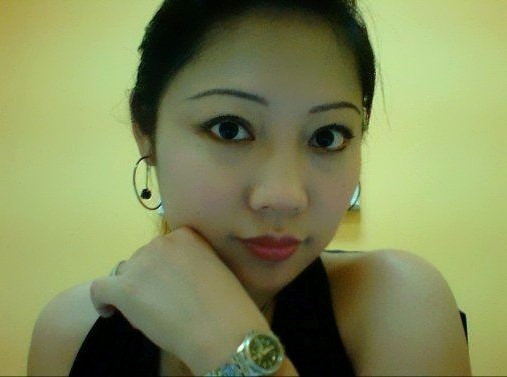 Grace Ooi is trained & certified by both CIDESCO (Swedish) & CIBTAC (UK). Grace has more than 10 years of beauty teaching experience (practical & theory) at many well-known beauty schools & beauty Spa. Her expertise in the beauty industry allowed her to help set up many beauty establishments. In additional, Grace is also a charismatic public speaker for beauty & wellness seminars. Her specialized talks include technical topics like skincare products knowledge, skin problem resolve knowledge, skin structure, equipment knowledge to personal grooming & etiquette, are attended by people from all walks of life. Anyone who has met Grace would have agreed that the elegant lady owner exudes an aura of charm. After analyzing my skin, Grace recommended me the Gatineau "Anti-Wrinkle + Visible Lifting" Treatment using Gatineau Paris products, a leading French skin care brand. Gatineau laboratories have created an avant-garde treatment that produces a genuine lift in 3 dimensions within the epidermis: the exclusive complex of active ingredients in DEFI LIFT 3D™, resulting from the latest cosmetology discoveries, tighten the mesh of the skin for an immediate & long lasting lifting effect. Defi Lift restores the skins support network at 3 different levels rebuilding the skins natural cushion. The Gatineau DEFI LIFT 3D treatment is a virtual "beauty procedure" alternative to cosmetic surgery & may be recommended from the age of 30+. The appearance of skin imperfections is diminished, the skin's texture is refined, the appearance of expression lines is reduced. The skin feels better toned & firmer, as if re-texturised deep down. Exfoliate (Anti-aging exfoliant): Help revitalize, tone & stimulate, refine the skin's texture & reduce the appearance or wrinkle depth. Apply Serum (Anti-age moisturizing concentrate): Provides a tensor effect & restructures & firms tissues. Machine (Warm massager + Defi Lift 3D Skin Densifier Lift Gel): Immediate tensor effect; firming & redensifying & moisturizing effect. Massage (Defi Lift 3D Dermo-Relaxing Care Lift Gel Cream): Dermo-relaxing action, smoothing action. Helps restore the support fibers, increases firmness & retexturizes. Defi Lift 3D Lift Mask + Plastifying Liquid: Immediate & long-lasting tensor effect. Helps stimulate cell renewal & ultra-moisturizing. See the Before & After results. One side of my cheek is visibly lifted & plumped up! The "Visible Lifting" Treatment offers visible anti-ageing results after just one session! Defi Lift 3D Serum, Melatogenine Force Collagene, Serenite Gentle Cleansing Toner, Defi Lift 3D Lip Care, Melatogenine Essential Skin Corrector & Melatogenine Essential Eye Corrector. It was my first experiencing the pinching method during an exfoliation, a massage that uses stimulating & relaxing techniques. Apparently, this method stimulates cellular respiration, helps smoothen out wrinkles & relieves tension. Grace is extremely gentle with skills unmatched. After the facial, my skin is more radiant & fuller-looking, as if "re-plumped" from within. This Gatineau treatment offers mature, demanding or age-conscious skins an immediate 'lift effect'. I like the unique professional treatment that provides a gentle alternative to cosmetic surgery. 1st trial @ S$125 (u.p S$250) 1hr 30mins. Package 8 sessions @ S$1500 (6+2) & free 8 sessions of Collagen Eye treatments (worth S$780). Wanna win some Gatineau Products? 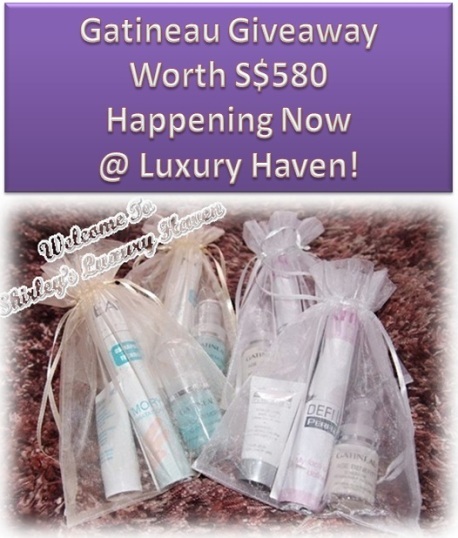 Hope over to Gatineau Giveaway Worth S$580 Happening Now At Luxury Haven! Hurry, contest closes 7 Feb 2013! Thanks so much Grace, for your tender loving care! Whoa! More choices of fantastic facial treatment to choose from! And another giveaway too! Who can resist revisiting luxury haven? Reana, hope it'll turn out radiant & nice! Enjoy your facial tmr! whoa..u hav a very good complexion unlike me..i got pimples and blackhead. this plc sound like heaven...maybe i will giv a visit soon....r u taking part the masterchef blogger in spore? Alexa, thks for the kind note! Guess I'm just lucky. Masterchef blogger in S'pore? Don't think I'm near that level yet. Hahaha! Alexa, all the follow buttons are on the right side of this blog. I thank u in advance & it's great having u here! Very impressive skin treatment and also I wanna try the same. Checking out their fb page soon. Wow Shirley your skin is flawless! Homeandfood, thks for the kind gesture & have a good weekend! I have not been to facial for a while now..since I have started with my kids fashion shop, don;t think I have got the time to pamper my skin with a relaxing facial. Uru, I adore facials! Hahaha! I love that sort of pampering...especially when it's with a top notch esthetician! Lucky you! After reading so many of your posts about facial, massages .I finally went this year to a spa which is in our gym. I have been going to gym for so many years but never went inside the spa. Honestly. I got the skin tightening one. Even she did the pinching exfoliation thing, seems like its new treatment. It was my first experience and very relaxing one. Bal, finally! It's really nice to know that my posts have motivated u to visit one. I'm sure u looking radiant & even prettier now! Antonella, have a good week! My dear you are getting younger and younger every day. YL, I hope so! Hahaha! Kim, u're truly my fan! Yap, I don't always give 5-star ratings & strongly stand by being honest in my reviews. Hahaha! Love your wit! Amelia, love your sense of humour. Lol! Moral of the lesson: never keep a calculator at home!! Hahaha! Pepper, a good place to check out!